Your mom suddenly gets lost driving back from her neighborhood grocery store. Your dad can’t figure out which tool to use to fix that squeaky door. You discover that your parents’ bills have not been paid for months. When you ask them about it, they act defensive, nervous, or even get angry. 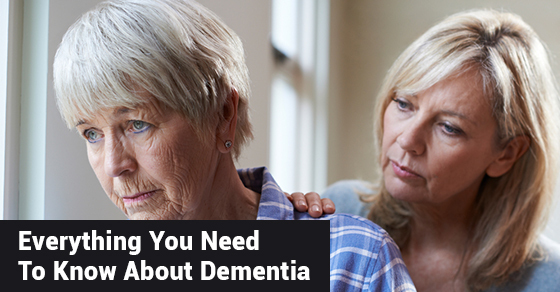 We will share with you everything you need to know about dementia. Contrary to what many people believe, dementia is NOT a disease. Dementia encompasses a wide group of symptoms where the patient develops a progressive loss of cognitive functions, especially memory, which ultimately affects their daily activities. It also affects their behaviour, communication, and relationships. A patient can develop dementia slowly over time, so the symptoms are not always that noticeable. Dementia or mental decline is NOT a common result of aging. In fact, early onset dementia can strike patients in their 40s and 50. Most patients with dementia symptoms (over 60%) are actually suffering from Alzheimer’s Disease. Another type of dementia can be caused by a stroke, when certain parts of the brain are affected through trauma. This is known as vascular dementia. Let’s be clear that having these symptoms does not necessarily mean a patient has dementia. They could be from other treatable conditions, so the best practice is to have a professional evaluation to determine the cause. Not all these symptoms may be present and may only become evident slowly. As stated earlier, if you or a loved one are exhibiting some of these changes, see a physician for a diagnosis. They may recommend that you seek senior home care in Toronto. Damage to brain cells is the basic cause of dementia. When certain parts of the brain do not communicate correctly with others, symptoms develop which affect communication, reasoning, and memory. These changes in the brain are permanent and gradually worsen over time. Caring for a dementia patient requires patience and compassion. As the cognitive impairment symptoms slowly progress, more and more attention is needed to handle daily activities, especially personal hygiene like bathing and dressing. These responsibilities may become too much for a family member to handle effectively. Senior home care in Toronto is available at C-Care Health Services. These professional caregivers can come to your home or to an assisted care facility. They provide skilled care with compassion and knowledge. Affordable senior care in Toronto is available and customized to your budget.